On Wednesday, Feb. 4, ABC aired two episodes of “Fresh Off the Boat,” a new family sitcom based on Taiwanese chef and food personality Eddie Huang’s autobiography of the same name. Set in Florida during the 90s, the show explores Huang’s childhood as his family navigates the cultural challenges of settling into a city that is predominantly white. What this television show aims to do is examine Anglo Americans and the cultural dynamics from an Asian perspective — for once, the white person is the Other. The show stars Randall Park, Constance Wu, and Hudson Yang. Park is most recently known for playing the exaggerated version of Kim Jong Un in the irreverent comedy “The Interview,” while Wu is a newcomer to the small screen. The two adults play Huang’s father and mother respectively while Yang plays the young Eddie Huang. “Fresh Off the Boat” is the first sitcom to star an all-Asian starring cast since comedienne Margaret Cho’s sitcom “All-American Family,” which aired for one season from 1994 – 1995. That is 20 years since we’ve last had a show about Asians on American television. It doesn’t need to be repeated that this show is important and that there will inevitably be a range of reactions from all corners of our community. This is what happens when you have a lack of representation in the media. I’m going to preface this review by saying that I liked the first two episodes. Mostly. The second episode was stronger than the first. The pilot was, as all network pilots tend to be, awkward. Viewers are first introduced to the polished and sitcom-friendly versions of Huang and his family. Everyone seems a little shinier than they should be. My biggest critique is the distracting accents of Park and Wu. They were so distracting that it actually took me out of the show at times. As native English speakers, the two adult leads had to practice their Taiwanese-accented English to play Huang’s immigrant parents. Park is aware of his inauthentic accent. In a recent panel for the show, Park said he had previously worked with dialect coaches who gave him conflicting advice on how to replicate a foreign Asian accent. He concluded that Asian accents are multifaceted, and that while it is hard to create a consistent accent, he would continue to work on perfecting it moving forward. Race and cultural conflicts obviously play a central role in story lines. In one pivotal moment in the pilot, an African American boy calls Huang (Yang) a chink during a school lunch. Huang fought television executives to keep this scene. I cannot imagine how difficult it must have been to keep “chink” in a network television show. Huang famously penned an essay lambasting the show’s staff and network executives for tearing apart his autobiography and the original story he wanted to tell, but concluded that the show had a greater purpose, which is to serve as a vehicle of getting Asian representation into the media. This, of course, comes with tweaking or changing certain life experiences and making them more palatable for mainstream audiences. Huang eventually made amends with this, but there are certain incidents, like this “chink” scene, that he will fight for in order to avoid sugar-coating or diluting racial realities. It’s moments like these where the show works best — when it breaks free from what the network wants it to be versus the direction that Huang wants to take the show. It’s genuine, realistic, and relatable. “Fresh Off the Boat” exercises a heavy hand when it comes to introducing cultural conflicts between characters of different races or when discussing immigrant cultures. Sometimes, the writing holds the viewer’s hand too much. The show employs clichés, such as Wu’s “Tiger Mom” persona, that it feels unintentionally satirical. Conversely, maybe you have to resort to exaggerated stereotypes in order to create context for viewers that are foreign to Asian culture. This begs the question: Who is the intended audience for this show? What this show does well is to portray family dynamics. Wu has great comedic timing and Yang is a total natural for his role; their scenes together have been among my favorites. I had anticipated humorous conflicts between an Asian American kid and the immigrant parent — and I got that in spades — but what I was not expecting were direct references to my own Asian American childhood. In the second episode, Mama Huang homeschools the Huang children and a reference to a “Chinese Learning Center” was made. For the uninitiated, a “Chinese Learning Center” was a throwback to an educational/math center that Asian parents coerced their children into attending on the weekends. This was quite common in the 90s and early 2000s. Some Asian American youth resented their parents for this because it meant additional schooling on the weekends in lieu of fun. I was one of those kids growing up. I think everyone needs a relatable entry point to get on board with this show. This was mine. To answer my previous question on viewing demographics: “Fresh Off the Boat” is first and foremost for Asians and Asian Americans. Though the show clumsily educates on Asian culture, issues, and people through broad strokes, the show is at least successful in introducing relevant experiences for Asians, particularly for the Asian American millennial or the Generation X Asian. There is validation that comes with not just seeing someone who looks like you on network television, but in seeing people who have gone through the same cultural events and issues as you. 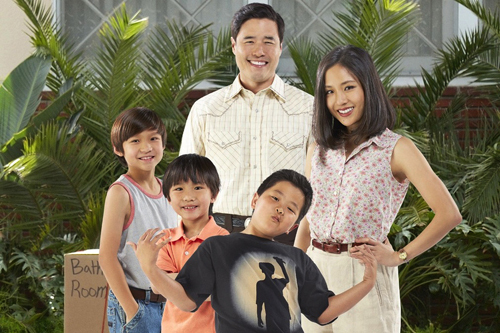 “Fresh Off the Boat” airs Tuesdays at 8:00 p.m. on ABC.